Social impact organizations, entrepreneurs, and B-Corps are developing products, applications, and platforms to change how we approach some of the world’s most difficult challenges. When passion, determination, and collaboration are combined, the social sector can make huge strides forward. These are the kinds of breakthroughs the Collaborative recognize and celebrate. Although every new iPhone model makes headlines news, inventions conquering disability, disease, and poverty don’t always get the press they deserve. To shed further light on their work, we’ve rounded up some of the most exciting innovations created by Classy Awards Finalists. Creations like these illustrate the social sector’s power to invent products that move society forward and improve lives. “There’s 40 million people who need a wheelchair but don’t have one,” explains Amos Winter, chief scientific advisor at GRIT. “And the majority of these people live in rural areas where the only connections to community, to employment, to education are by traveling long distances on rough terrain.” People all over the world need affordable, durable wheelchairs to reach their potential and thrive. Able to maneuver on many different terrains, both indoors and outdoors. Available for less than $200. Repairable without special parts or training. Winter, an accomplished mechanical engineer, adapted the same mechanics used in mountain bikes to enable movement over different terrains. These systems, combined with hand levers, allow users to best channel their upper body power. Over years of experimentation, trial and error, and feedback from users, GRIT developed the leveraged freedom chair (LFC). Durable and able to work on all kinds of terrain, this chair allows users to travel to school, work, and beyond. The detachable hand levers create greater torque and efficiency for off-road travel, but the chair’s small size and weight make it easy to maneuver indoors. Furthermore, because the LFC uses simple bicycle parts, replacements and repairs can be done anywhere in the world with little money or expertise. “The constraints on this design really pushed the innovation,” says Winter. By putting so much emphasis on the user’s circumstances and experience, these MIT engineers built a machine that is 76 percent faster, 41 percent more efficient, and gives users 51 percent more torque. GRIT shows that even machines and tools in use for centuries can be refined and reinvented to serve the people who need them most. Iron deficiency, which causes anemia, is a huge health concern in Cambodia and other countries with similar diets and resources. “Anemia is the most common nutritional problem in the world, mainly affecting women of child-bearing age, teenagers, and young children,” said Philippa Roxby of BBC News. The condition can cause fatigue, prenatal issues, and other serious health problems. When Dr. Christopher Charles realized the standard course of supplemental iron tablets was failing to solve the problem, he drew inspiration from the importance of fish to Cambodian culture. According to NPR reporter Michael Sullivan, “People earn money fishing, they’re a big part of the Khmer diet, their folklore, even their currency—the riel—is named after a fish.” Dr. Charles decided to create a fish to fight communities’ widespread anemia problem. The Lucky Iron Fish is a lump of iron shaped like a fish that, when submerged in boiling water, adds the missing nutrient to the food being boiled. Dr. Charles explained to NPR that users need only add a little lemon juice to help with absorption and then simply remove the fish and set it aside to cook with again. 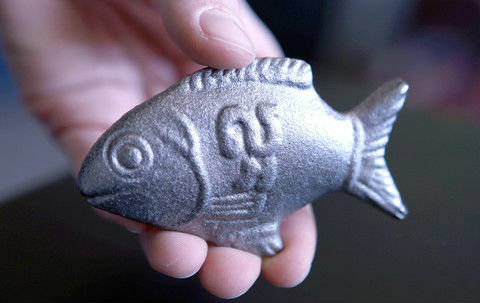 The invention’s website says “One Lucky Iron Fish can provide an entire family with up to 90% of their daily iron intake for up to 5 years.” Founded and run by Gavin Armstrong, the B-Corp behind the Lucky Iron Fish both sells them to consumers and donates them to social impact organizations. According to the International Centre for Prison Studies, “The United States has the highest prison population rate in the world, 716 per 100,000 of the national population.” Moreover, a 2005 study found that two-thirds of released prisoners are arrested again within three years. While several issues contribute to rampant recidivism, a lack of educational and employment opportunities is one of the biggest factors. “Although education is shown to decrease recidivism by 43 percent, four out of five of those in custody don’t have regular access,” says Edovo, a startup that created a tablet-based platform designed specifically to serve the imprisoned. Because security is such a big concern in prisons, the platform does not allow users to send communications or access the internet. It does, however, offer GED courses, vocational tracks, and life skills classes to help users succeed in their parenting, finances, and health. Edovo also features a library of videos and music that users earn access to by completing lessons. “As of now, counties in three states—California, Pennsylvania and Alabama—are providing Edovo to over 4,000 users in jails,” Forbes reported in March 2016. While the tablet-based education system is currently only available to a small percentage of America’s prison population, the results have been encouraging. Co-founder Brian Hill says, “We’ve seen decreased incidents of violence,” and Jack Pischke, the program administrator at Allegheny County Jail, told the Chicago Tribune, “[Prisoners] police themselves…they don’t want to lose the privilege.” A recent round of fundraising for Edovo means they can continue spreading their program to America’s more than 2.2 million inmates. India’s vaccine coverage rates are some of the lowest in the world. “In 2013, 7 million children did not receive all three doses for pertussis, also known as whooping cough. As a result, India recorded more cases of this life-threatening disease—31,000—than any other nation,” reports NPR. Much of India still uses paper vaccination cards, which are easily lost, forgotten, or misplaced, which leads to disrupted or incomplete vaccinations. Khushi Baby, a necklace implanted with an inexpensive chip carrying the child’s vaccination history, was developed by Yale students and first funded with a Kickstarter campaign. It has gone on to win Yale’s 2014 Thorne Prize for Social Innovation in Health and UNICEF’s Wearables for Good challenge, both of which provided funds to expand the program. The students behind Khushi Baby knew that many Indian families placed necklaces on their babies as a symbol of good luck and health. Combined with fairly simple technology, the tradition now helps protect children from vaccine-preventable diseases. Local health workers use an app to read the necklace’s chip and update the child’s records. “We sought to marry tradition with technology by transforming the kaala dhaago or black thread that is traditionally worn by children to protect them from nazar or the evil eye into a medical passport,” the team explains on their Wearables for Good profile. Khushi Baby demonstrates how technological progress and cultural history can help solve problems in developing communities. A simple pair of shoes can not only protect a child’s feet from injury, but also help to prevent exposure to harmful parasites and infections. But even if a child in a developing country has a pair of shoes, they are likely to quickly outgrow them. For many people, buying new shoes every year is simply not an option. While volunteering in Kenya, Kenton Lee noticed just how many children were wearing ill-fitting, damaged shoes. He thought to himself, “If only there was a shoe that could grow with the child, a shoe that could fit well and last for years.” When Lee returned to his home in Idaho, he founded Because International, a nonprofit to give children better lives. “Basically, we try to make things better by making better things,” their website explains. Building a better shoe was their first big project. Because International now produces a durable leather sandal that can be adjusted at three points and can grow by five sizes. They call it The Shoe That Grows. Because the shoes are made with sturdy, quality materials and simple snaps, they can last for up to five years. The product is available in a small size (ages 5 to 9) and a large size (ages 10 to 14). 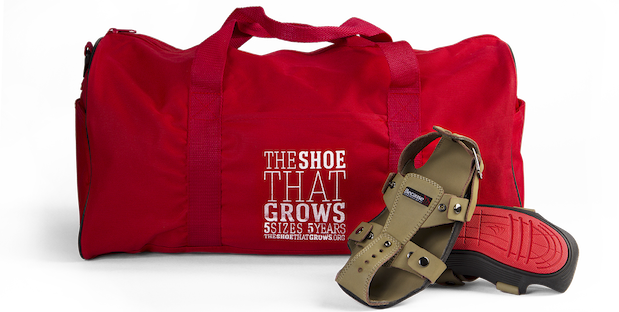 Consumers can purchase The Shoe That Grows for their own child and donate two pairs (all for $50) or send a pair to a child in need (only $15). Thousands of children in 20 different countries are now using The Shoe That Grows. While the project is still very young (they produced their first shoe in 2014), this practical invention from Because International stands to make a long-term impact on the health and wellness of children in need. These are just a few of the amazing organizations and social enterprises shaking up the world of social good.